Please take a hint from GGG. (Thumbs up to OP)Unfortunately, I think that you will find that the new mobile Diablo Immortal game will be highly incentivised with loot boxes or some kind of auction house/store. This is the new norm today, to rake in as much dough now but possibly destroy any future the founding company would have had.Solution: use your wallet to do the talking; they will start to listen when stocks/profits go down, and people start getting laid off, or paid bonuses to retire (oh wait ...). 11/24/2018 07:46 PMPosted by BossDoggSirRight,Shoot me a message in the Blizz launcher about what games you are playing currently and any upcoming games you plan on playing.Will do! Good to see you again. 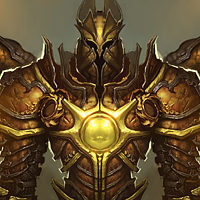 SirRight approves BossDogg's request :) ... perhaps it is time to make Diablo 3 a standalone game. Folks who miss the AH or RMAH. Why do you want it back? ... Real quitters just leave in silence...True. Thinking About Picking Up D2, D3 or PoE..
07/04/2018 05:38 PMPosted by SunStriderTitan Quest Anniversary EditionI too was going to suggest this game but ensure to also get the new expansion for it as well (Steam is one of the places to get the game). Introducing the Solo Self-Found League! I think this is a great idea and initiative and wish you all the best. Anything that can add some diversity to a game, not hurt anyone else but give fun to players who choose to do this, is good for Diablo 3.Just ignore the haters and trolls because they hate anything that doesn't fit their own narrative, and they will do anything to silence change for the greater good.